If you’re travelling to Africa for a safari, chances are you’ll be stopping over in a city for a night or two. When it comes to beautiful Cape Town and its gorgeous Winelands, we wouldn’t blame you for wanting to stay for at least a week! Africa’s cosmopolitan cities are starting to gain the recognition they deserve and wherever possible, we always recommend at least a night or two immersing yourself in local life. Nairobi, Johannesburg, Cape Town, Durban and Stone Town all are thriving cities with incredible cultural diversity and beautiful natural heritage. With the help of our handy infographic, you'll know what type of clothing is best suited to an ‘urban safari’ in Africa. 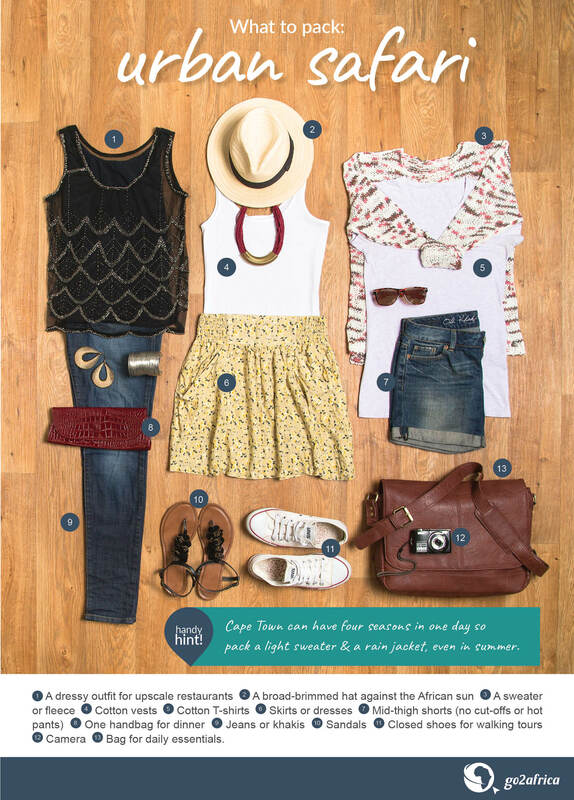 Cape Town can be windy so remember to bring shorts in addition to your flowing summer dresses or skirts. South Africa is fairly liberal in terms of dress code but in Nairobi its best to keep everything between your shoulders and knees covered. If you are visiting mosques, temples, churches or conservative neighbourhoods like the colourful Bo-Kaap in Cape Town, dress modestly (there is no need to cover your head but make sure everything from at least mid-thigh to shoulder is covered). Africa’s daytime temperatures are moderate but winters can be cold especially in the mornings and evenings. Even summer has the occasional chilly wind. To prepare for the four-seasons-in-one-day phenomenon, it’s best to pack both warm and cool clothing, including a fleece or warm raincoat. Always bring gear to protect yourself from the sun. A wide-brimmed hat, high SPF sunblock and good quality, polarised sunglasses are essential. A scarf or buff is a good idea – these will help fight a chill and double as sun protection. A kikoi (a traditional striped African cloth) has many uses: as a wrap against the chill or sun, as a scarf, a cover-up around the pool or on the beach, and as a makeshift picnic blanket on the beach! Closed, comfortable walking shoes are a must especially if you are going up Table Mountain or heading out on a boat for whale watching or to visit Robben Island. Leave some space in your luggage for shopping items including lots of gorgeous African jewellery (from beaded to diamond and tanzanite). Check out some of our favourite urban walking tours in Cape Town, Joburg and Stone Town here. Want to know more about Africa’s secret places and incredible urban life? Sign up to our newsletter for insider info on African travel. If you’re ready to start planning your dream adventure, get in touch with a friendly African Safari Expert today.